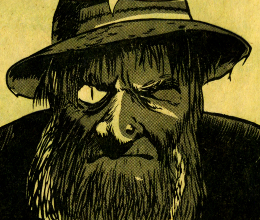 Aliases: "The old stranger," "the old man"
(Adventure into Terror#19 (fb) - BTS) <According to Mrs. Karzni> - The town of Visegrad was once spotless and pest free. They were happy, and their children were healthy. (Adventure into Terror#19 (fb) - BTS) <According to Mrs. Karzni> - One day, without warning, the entire town -- taverns, restaurants, homes, etc. -- was plagued with roaches. The townspeople united in trying to overcome the sudden flood of these "disgusting creatures," but the cockroaches seemed limitless in number by both day and night, no matter what they did. (Adventure into Terror#19 (fb)) <1948> - The mayor of Visegrad called together a meeting of the town council for their advice, as they had never before faced such a monstrous problem. The council agreed, and one elderly member noted that talk would do no good: They needed to find someone to find the solution. Just then, Elod Kisfaludi appeared, concealing his name but telling the mayor and council he could dispose of all the roaches. The council members asked who he was and where he would come from, but he told them it didn't matter who he was. He told them he could -- through black magic -- dispose of all of the roaches...if they would pay him a fee. Desperate, the mayor told the stranger he would pay whatever he asked from the town funds if he was successful. (Adventure into Terror#19 (fb) - BTS) - The "old stranger" and the mayor agreed upon a price. 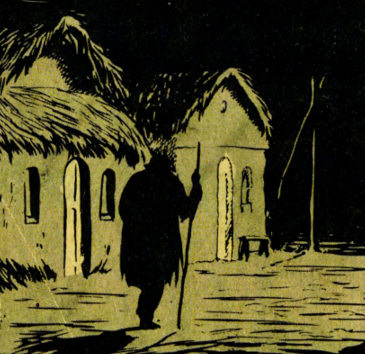 (Adventure into Terror#19 (fb)) - That night, there was a strange silence throught Visegrad, and nothing was heard but the muffled footsteps of "the old man" as he walked from house to house. (Adventure into Terror#19 (fb) - BTS) - The next morning, the townspeople ecstatically noted that the roaches were gone. (Adventure into Terror#19 (fb)) - The old sorcerer went to the mayor's office, announcing his success and requesting his fee, but he was upset when the mayor gave him only half of the agreed upon price. He questioned the mayor, who told him that he had decided his price was too high, and that that was all he would pay. Elod warned the mayor that he did not like being cheated, but the mayor mockingly told the old man the roaches were gone and asked if he would bring them back. Elod furiously told the mayor, "Yes, I will bring the roaches back! But I will do even more than that! All of your children...all of them...I will turn into roaches..." Unbelieving, the mayor told the old man not to threaten him with nonsense and threatened to set the dogs on him if he did not get out of there right away. Elod departed, but warned the mayor not to forget his warning. (Adventure into Terror#19 (fb) - BTS) - Though the villagers all laughed at the old man's threat and went to sleep content that the cockroaches were gone forever, that night, the Mikloses and the village's other parents, were awakened to the sound of their children's screams. They rushed into their kids' rooms and found their beds empty...except for cockroaches...apparently the same number of roaches as missing children; all of the village's children were gone. The next day, the roaches returned, just as they had been before, but neither the children nor the old man were ever seen again. Unable to tell which of the roaches were true roaches as opposed to their transformed children, the people of Visegrad fed and protected all of the roaches. (Adventure into Terror#19 - BTS) - Mrs. Kazni stopped visiting US traveler John Sterner from killing the cockroaches, explaining their history to him. Comments: Created by unidentified writer and Sam Kweskin. Elod's real/ful name was revealed in the Official Handbook of the Marvel Universe A to Z Vol. 14 (2010), as was the town of Kisfaludi in the nation of Hungary. Technically, his first name is Előd...but some internet browsers have trouble with symbols, so I didn't include that in the text. Similarly, the village is properly spelled Visegrẚd. I think that's the proper accent anyway! It is POSSIBLE that Elod did not magically rid or return the cockroaches, but instead used some trick (perhaps some sort of scentless repellant that just drove them off or another that could lead them back). It appears that he did transform the children, but he could also have transported the children away and replaced them with cockroaches. Again, it is possible that he did not use magic to do so, but he seemed to be a single old man, and it doesn't seem very likely he could have abducted all of the town's children (even if he had help) and get away unseen without leaving a trail of any kind. It is possible that Elod generated the plague of cockroaches on Visegrad in order to gain money from their eradication. But, there's also nothing that really supports that. The cockroaches showed up suddenly, but change of climate or sanitary habits may have been the cause. No, I don't have Adventures into Terror#19...but I do have Monsters Unleashed#6 (June, 1974), in which this story was reprinted. 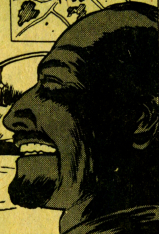 Presumably the original story was in color, and if anyone can supply color images, I am willing to replace this profile's grayscale black & white images. Thanks to Henry and Kate Christiansen for helping me scan some of the images! (Adventure into Terror#19 (fb)) <According to Mrs. Karzni> - The children of the town of Visegrad were happy and healthy when their town was pest free. Mrs Krazni sent her children outside to play, because she had work to do. (Adventure into Terror#19 (fb)) <According to Mrs. Karzni> - One day, without warning, the entire town -- taverns, restaurants, homes, etc. -- was overrun with roaches. Even during the daytime, the cockroaches ran over the children as they read their books. (Adventure into Terror#19 (fb) - BTS) - The mayor made a contract to pay a mysterious old man visitor (Elod Kisfaludi) to get rid of the cockroaches, but then only paid half of the agreed upon price. When the mayor mocked the old man's outrage at being cheated, Elod furiously told the mayor, "...I will bring the roaches back! But I will do even more than that! All of your children...all of them...I will turn into roaches..." Unbelieving, the mayor told the old man not to threaten him with nonsense and threatened to set the dogs on him if he did not get out of there right away. Elod departed, but warned the mayor not to forget his warning. 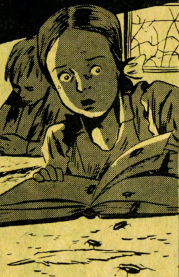 (Adventure into Terror#19 (fb)) - That night, the Mikloses and the village's other parents, were awakened to the sound of their children's screams. They rushed into their kids' rooms and found their beds empty...except for cockroaches...apparently the same number of roaches as missing children; all of the village's children were gone. 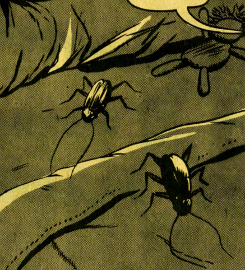 (Adventure into Terror#19 - BTS) - The next day, the roaches returned, just as they had been before, but neither the children nor the old man were ever seen again. (Adventure into Terror#19 - BTS) - Unable to tell which of the roaches were true roaches as opposed to their transformed children, the people of Visegrad fed and protected all of the roaches. 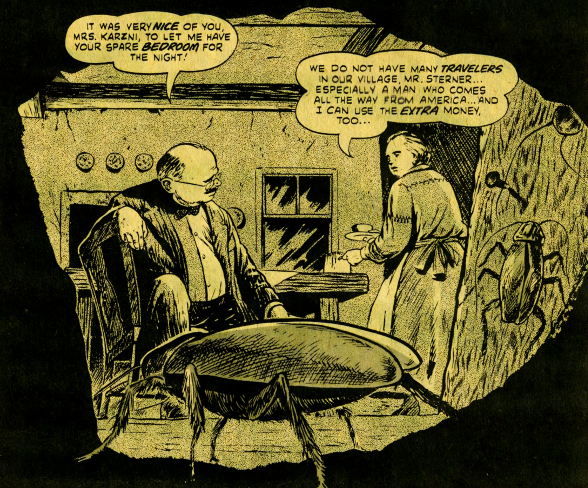 (Adventure into Terror#19) - Mrs. Kazni stopped visiting US traveler John Sterner from killing the cockroaches, explaining their history to him. Note: The pre-transformation children of Miklos & Mrs. Karzni can also be seen in the upper image in Mrs. Karzni's sub-profile. (Adventure into Terror#19 (fb) - BTS) - Like the rest of the people of Visegrad, Miklos and his wife were helpless against the sudden cockroach infestation that assaulted their town. Miklos may or may not have been part of the town coucil gathered by the mayor to deal with the plague, during which the mayor contracted with a mysterious old man (Elod Kisfaludi) to get rid of the cockroaches. However, the mayor only paid the old man half of what he had asked, and the old man vowed to not only bring the cockroaches back but to turn all of the children of the village into cockroaches. Miklos and everyone in the village were happy to be rid of the cockroaches and did not believe the old man's threat. 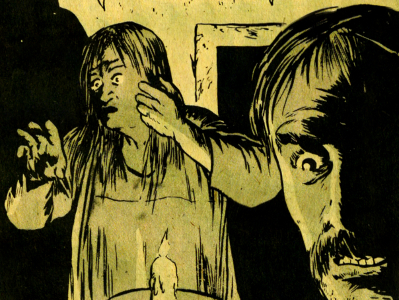 (Adventure into Terror#19 (fb)) - That night, Miklos and his wife were awakened from their sleep by the sound of their children screaming. They rushed to their children's room, but found the children missing...but a pair of cockroaches was instead present in their children's bed. (Adventure into Terror#19 (fb) - BTS) - They soon found the same thing had happened to the rest of the villlager's children, and then the next day, the cockroaches again overran the village as before. Unable to tell which of the roaches were true roaches as opposed to their transformed children, the people of Visegrad fed and protected all of the roaches. (Adventure into Terror#19 (fb) - BTS) - Like the rest of the people of Visegrad, Mrs. Karzni and his her husband were happy and content in their town, which they considered spotless and pest free. 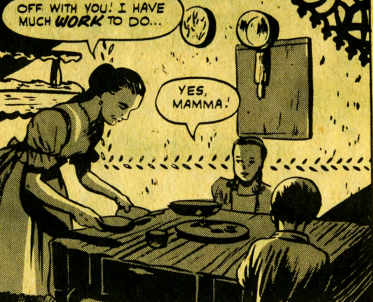 (Adventure into Terror#19 (fb)) - Mrs Krazni sent her children outside to play, because she had work to do. (Adventure into Terror#19 (fb) - BTS) - Like the rest of the people of Visegrad, Miklos and his wife were helpless against the sudden cockroach infestation that assaulted their town. A town coucil was gathered by the mayor to deal with the plague, during which the mayor contracted with a mysterious old man (Elod Kisfaludi) to get rid of the cockroaches. However, the mayor only paid the old man half of what he had asked, and the old man vowed to not only bring the cockroaches back but to turn all of the children of the village into cockroaches. Mrs. Karzni and everyone in the village were happy to be rid of the cockroaches and did not believe the old man's threat. (Adventure into Terror#19 (fb) - BTS) - They soon found the same thing had happened to the rest of the villlager's children, and then the next day, the cockroaches again overran the village as before. Unable to tell which of the roaches were true roaches as opposed to their transformed children, the people of Visegrad fed and protected all of the roaches. Though they could not be certain that any of the roaches were their children, they felt they had no choice to believe their children had been transformed rather than risk harming their children. 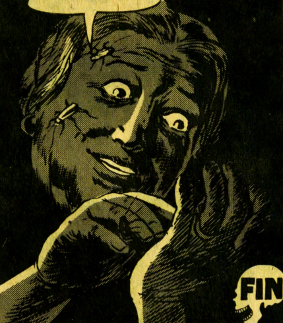 (Adventure into Terror#19 (fb) - BTS) - Mrs. Karzni was pleased to accept the traveling American John Sterner as a boarder in her house, as she needed the money. 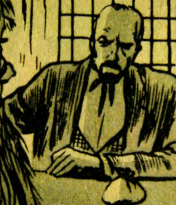 (Adventure into Terror#19) - Mr. Sterner thanked Mrs. Karzni for putting him up in her spare bedroom, and she explained that they did not have many travelers in thrir town, especially not all the way from the USA, and that she could use the extra money. 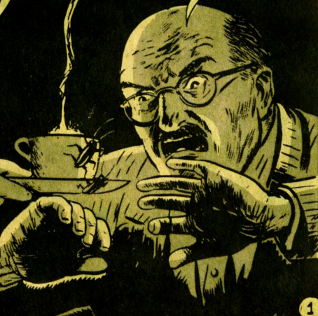 When she served him a cup of hot coffee, he first noticed and was repulsed by the ubiquitous roaches. When he prepared to stomp on and kill the roaches, she stopped him, telling him they must never be harmed. She then explained to him why she did not want the roaches destroyed, noting that while he may not believe the story, the people of Visegrad had no choice but to believe. Note: Mrs. Krazni can also be seen in a more full body picture (though shown in a mostly rear oblique) in the main image from the children sub-profile, as well as with her hair down in the image for Miklos. (Adventure into Terror#19 (fb) - BTS) - Like the rest of the people of Visegrad, the mayor was helpless against the sudden cockroach infestation that assaulted their previously "spotless and pest free" town. (Adventure into Terror#19 (fb)) <1948> - The mayor of Visegrad called together a meeting of the town council for their advice, as they had never before faced such a monstrous problem. The council agreed, and one elderly member noted that talk would do no good: They needed to find someone to find the solution. Just then, an old stranger (Elod Kisfaludi) appeared, telling the mayor and council he could dispose of all the roaches. The council members asked who he was and where he would come from, but he told them it didn't matter who he was. He told them he could -- through black magic -- dispose of all of the roaches...if they would pay him a fee. Desperate, the mayor told the stranger he would pay whatever he asked from the town funds if he was successful. (Adventure into Terror#19 (fb) - BTS) - That night "the old man" walked from house to house. 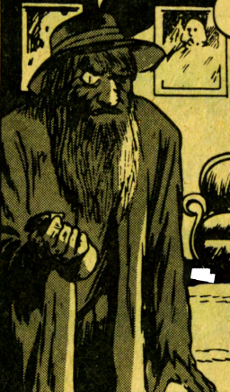 (Adventure into Terror#19 (fb)) - The old sorcerer went to the mayor's office, announcing his success and requesting his fee, and the mayor paid him a sack of coins. The sorcerer was upset when the mayor gave him only half of the agreed upon price. He questioned the mayor, who told him that he had decided his price was too high, and that that was all he would pay. Elod warned the mayor that he did not like being cheated, but the mayor mockingly told the old man the roaches were gone and asked if he would bring them back. Elod furiously told the mayor, "Yes, I will bring the roaches back! But I will do even more than that! All of your children...all of them...I will turn into roaches..." Unbelieving, the mayor told the old man not to threaten him with nonsense and threatened to set the dogs on him if he did not get out of there right away. Elod departed, but warned the mayor not to forget his warning. (Adventure into Terror#19 (fb) - BTS) - Though the villagers all laughed at the old man's threat and went to sleep content that the cockroaches were gone forever, that night, the village's parents were awakened to the sound of their children's screams. They rushed into their kids' rooms and found their beds empty...except for cockroaches...apparently the same number of roaches as missing children; all of the village's children were gone. (Adventure into Terror#19 (fb) - BTS) - US citizen John Sterner took a trip across Europe. (Adventure into Terror#19 (fb) - BTS) - Traveling to the small Hungarian town of Visegrad, John Sterner arranged to stay with Mrs. Karzni. 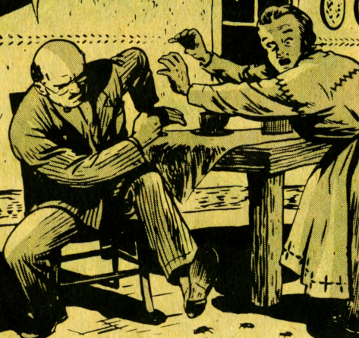 (Adventure into Terror#19) - Mr. Sterner thanked Mrs. Karzni for putting him up in her spare bedroom, and she explained that they did not have many travelers in thrir town, especially not all the way from the USA, and that she could use the extra money. When she served him a cup of hot coffee, he first noticed and was repulsed by the ubiquitous and "tremendous" roaches. When he prepared to stomp on and kill the roaches, Mrs. Karzni stopped him. Asking why, he pointed out the dozens of filthy and disgusting roaches crawling all over the floor. She initially responded by telling him they must never be harmed. When he looked at her in astonishment that she would have compassion for roaches, she realized she had to explain the reasons, which she did; she further noted that while he may not believe the story, the people of Visegrad had no choice but to believe.